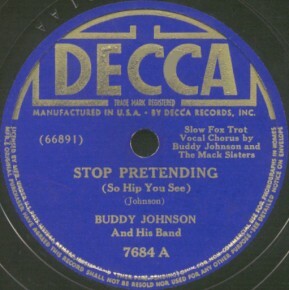 "Stop Pretending (So Hip You See)"
Above: Photo of Buddy Johnson And His Band. 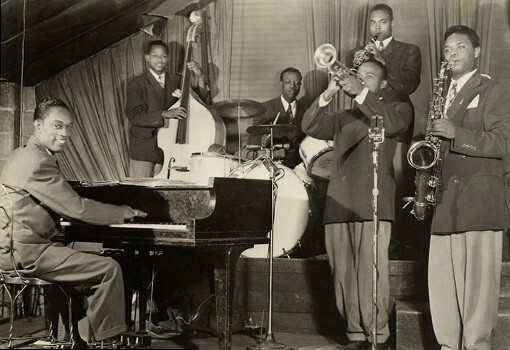 He was a band leader, pianist, and singer. 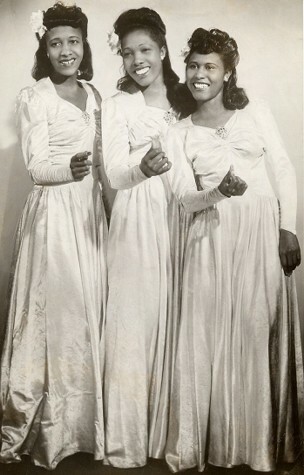 Above: Photo of The Mack Sisters. Written on back of photo: "finest sepia girl harmony trio" and dated May 1948. 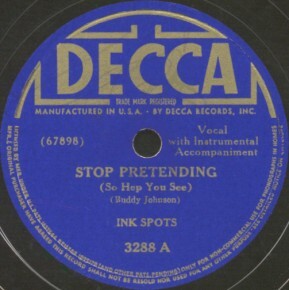 Above Left: Decca 7684 label image of "Stop Pretending" released in 1939. Note the writer's credit. This was Buddy Johnson's first record and was followed by many releases on the Decca label (1939-1954). After Decca, he had a long tenure at Mercury (1953-1961). Above Right: Decca 3288 label image of The Inks Spots' version of the same song released in 1940. Ivory "Deek" Watson is the lead singer and Asa "Ace" Harris plays the piano on this one. A) Click on an option below to listen to both versions of Stop Pretending using Streaming RealAudio. NOTE: If this file streams rather than downloads, you need to adjust your RealPlayer settings. Click HERE for details.